Archie William Long was born March 17,1872, in Ravenswood, Jackson County, West Virginia. His parents were George W. (Aug 10, 1847, Wheeling W.V. a blacksmith) & America E. (May 20, 1850 Wirt County, W.V.) (King) Long. He had a brother, Hiram A. Long of Wamego, Kansas. Archie moved to Fargo, North Dakota in 1891 at the age of 19. There he worked as a miller. Then sometime around August 1892 he moved to Manhattan, Kansas after a stop of an unknown period in Minnesota. Sometime around 1892 he help found the Manhattan Milling Co., where he remained until 1903 when he and O.C. Barner started the Long-Barner Milling Co.
Then in 1912 he sold his shares in the two mills and from 1913 to 1915 he tried his hand at farming. 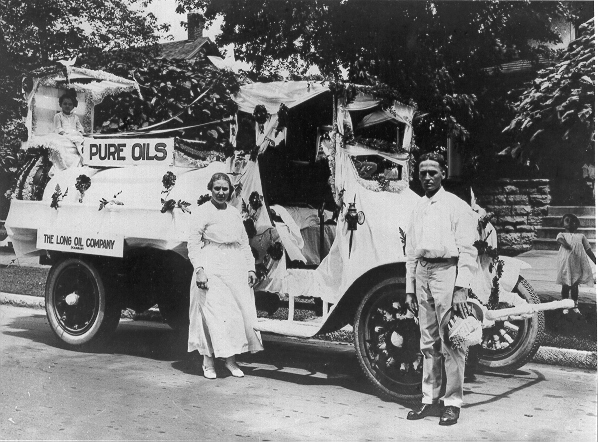 On June 21, 1903 he married Laura Engel daughter of Carl Engel of Manhattan, Ks. And with his new wife moved to 206 Houston St. They had a daughter, Ruth E. Long born June 19,1905. Archie belonged to Masonic Temple (32nd degree mason and Noble of the Mystic Shrine), Elks, Kiwanis Club, YMCA, and First Presbyterian Church. Was twice a candidate for Kansas state legislature before 1918. Was presidential elector for Democratic party in 1928. Was Mayor of Manhattan from 1909-1910. During his term he initiated the building of the sewer system and the pavement of streets. Also served one term on city council before being mayor. Photo of Mayor Long from 1910 newspaper article at right. © Copyright Ben Eckart . All rights reserved.